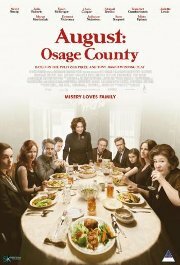 The film version of a multi-award-winning play, this is a dark, hilarious and deeply touching story of the strong-willed women of the Weston family, whose lives have diverged until a family crisis brings them back to the Midwest house they grew up in, and to the dysfunctional woman who raised them. No persons under 16 (Language). Who's turn is it to chew the scenery?